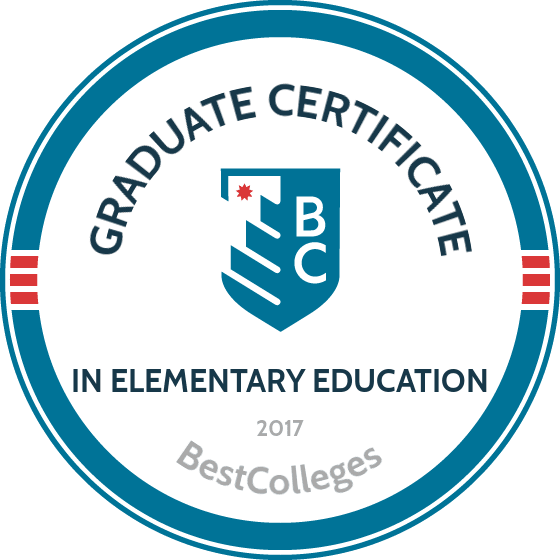 What Are The Best Online Graduate Certificate in Elementary Education Programs? What Will I Learn in an Online Graduate Certificate in Elementary Education Program? What Can I Do With a Certificate in Elementary Education? With a steady job growth rate of 6%, the demand for elementary school teachers is projected to increase through 2024. If you're enthusiastic about learning, love working with kids, and have a bachelor's degree in an unrelated field, a graduate certificate in elementary education can help you begin your career as a teacher without completing an expensive and time-consuming master's program. In this guide, we'll cover the details of earning a teaching certificate online, from choosing a program to paying for school. Primarily a commuter school, GMU has expanded its distance education programs over the last decade. Unlike other certificate programs, GMU’s graduate certificate program in international elementary education offers an option for international baccalaureate certification, in addition to standard pre-K through sixth grade licensure in the state of Virginia. Students complete 27 credits, including studies in teaching elementary social studies, math, science, and language. Students also complete an internship in the field. Applicants must have taken the Praxis Core and must be within nine credits of elementary education endorsement. Students may complete the program on a part-time or full-time basis. Drexel offers an accelerated elementary education certificate; students may complete the graduate intern teaching certification in as few as nine months. The 42-credit program prepares students to teach in pre-K to fourth grade classrooms and combines online, asynchronous coursework with in-person internship experiences. Internships include 130 hours in observing, participating and assisting, pre-student teaching, and graduate student teaching. The curriculum includes studies in teaching special education, social studies, mathematics, science, and English as a second language. Applicants must hold a bachelor’s degree from a regionally accredited institution and should have at least a 3.0 undergraduate GPA. GRE scores are not required. Located in Portales on the border of Texas and New Mexico, ENMU offers an alternative licensure program in elementary education. ENMU’s graduate certificate in elementary education program caters to New Mexico teachers with a year of teaching experience who want to obtain level I teaching licenses. The 21-credit program leads to K–8 licensure in New Mexico and consists of coursework in literacy, trends in education, and teaching exceptional students. Graduates of the program may apply all 21 earned credits toward ENMU’s master’s degree in pedagogy and learning. Applicants must have a minimum 3.0 undergraduate GPA and 30 undergraduate credits in English, science, math, and social studies. UNC Charlotte, one of the UNC system’s more prominent branches, boasts an extensive distance education program, including a graduate certificate in elementary school mathematics. UNC Charlotte’s graduate certificate in elementary education program leads to a mathematics licensure add-on in the state of North Carolina. The 18-credit program consists of six courses in elementary mathematical education. Students may apply 15 of these credits toward UNC Charlotte's master's of education in elementary education. The program offers four start dates throughout the year. Applicants should hold a valid elementary education teaching license. The program is not yet available to students residing outside North Carolina. Mizzou offers one of the most affordable online elementary education certificates in the nation. The online program mimics its on-campus counterpart; students take two courses per semester and finish in two years. The program's 24 required credits comprise studies in algebraic reasoning, geometry, number sense, and mathematics leadership. Students meet online five times per semester at scheduled checkpoints. Online students completing summer coursework may attend sessions on campus, but video conferencing is available for distance learners. Applicants must have earned a 3.0 GPA during their last 60 undergraduate credits and must have at least two years of teaching experience. GRE scores are not required. All online students pay in-state tuition. Each program is different, but they all include crucial concepts and state-mandated course requirements for elementary education certificate programs. Regardless of school or location, you're likely to encounter the following courses, which introduce concepts and techniques integral to the field of elementary education. Elementary literacy: This course provides a broad foundation in theories of literacy acquisition and teaches students to apply theories in the classroom. Coursework emphasizes basic principles of teaching reading and writing and the importance of recognizing diverse learning styles. Methods of instruction: Students develop effective methods of teaching elementary-level learners. The course emphasizes the importance of incorporating play into early education and explores methods of integrating technology into the elementary classroom. Child development: Coursework explores the mental and physical development of children from birth to adolescence, learning styles common to each developmental stage, and corresponding instructional methods. The course introduces concepts necessary to develop a science-based teaching methodology. Whether your bachelor's degree is in biology or English literature, a graduate certificate in elementary education prepares you to bring your academic passion to the classroom. A teaching certificate is ideal for enthusiastic, patient individuals. While graduates typically pursue positions based on their academic background, teaching classes such as math or social studies, the following careers are also common for professionals with a graduate certificate in elementary education. Preschool teachers instruct children under the age of five through guided play. Unlike most elementary instructors, preschool teachers are often employed outside the public school system, at childcare centers or nonprofit organizations. These educators specialize in the instruction of students with disabilities and special needs. Rather than teaching classes on a single subject, some elementary school teachers instruct a single class on a range of fundamental topics, such as basic literacy, math, and writing. Like a bachelor's or master's degree, a graduate certificate in elementary education should be earned through an accredited institution. An accredited school meets ethical and academic standards set by accrediting bodies. An institution may be regionally or nationally accredited. Most nationally accredited schools are for-profit institutions that provide vocational training, while regionally accredited schools tend to be nonprofit and academically focused. Credits earned through regionally accredited colleges transfer easily to regionally or nationally accredited schools, but most regionally accredited institutions do not accept transfer credits earned through nationally accredited schools. Some teaching certificate programs may also be accredited by field-specific organizations such as the Council for the Accreditation of Educator Preparation and the Teacher Education Accreditation Council. There are plenty of options to finance an elementary education certificate. The first step is completing the FAFSA to determine your eligibility for federal financial aid, such as grants, loans, and work-study opportunities. Remember to search for scholarships; many public groups, institutions, and private organizations offer funding to students pursuing careers in education.